This PMR study on Mud Pumps offers an eight-year forecast for the global Mud Pumps market between 2018 and 2026. The Mud Pumps market study considers 2017 as the base year with market values estimated for the year 2018 and forecast developed for the duration 2018 to 2026. Compound Average Growth Rate (CAGR) for the Mud Pumps market study has been represented from 2018 to 2026. This Mud Pumps market study covers various perspectives of the market, including market dynamics, value chain and pricing chain analysis, competition analysis, regional and segmental growth comparison and macro-economic and industry growth analysis, along with segment level projections in a comprehensive manner. As per the findings of the study and perspectives of industry participants, the global Mud Pumps market is projected to grow at a CAGR of 4.4% between 2018 and 2026, in terms of value. Growing well drilling activity in oil and gas industry and reasonable cost of operations are some of the factors positively impacting the uptake of Mud Pumps in the global market. Mud Pumps are products used for circulating drilling fluid with very high pressure. It is one of the key equipment on the oil field drilling rig. The primary application of a Mud pump is to wash out the bits of rocks & sand by circulating drilling fluid down the drilling hole during the process of crushing. The Persistence Market Research report on Mud Pumps carefully analyses the market at a global and regional level through market segmentation on the basis of key parameters, such as product type, application, Drive Type and region. This Mud Pumps market report is structured to facilitate the reader to develop a thorough understanding of the market. The report begins with market definitions, which are followed by market background, market dynamics and market analysis by key segments, regional analysis and competition landscape. Each section of the Mud Pumps report covers a qualitative and quantitative assessment of the market on the basis of facts, historical developments and key opinions collected from industry participants through dedicated interviews and trends in the market. The Mud Pumps report begins with a market introduction, which defines the market taxonomy and product definitions with respect to the global Mud Pumps market assessment. In the next section, the Mud Pumps report describes the market development background, covering macro-economic factors and industry factors affecting the Mud Pumps market for the base year considered for the study. The next section of the Mud Pumps report discusses market dynamics, such as drivers (supply and demand side), restraints and trends, impacting the market growth at a global level. This section also includes the impact assessment of market dynamics on the global Mud Pumps market. Subsequent sections of the Mud Pumps report provide value (US$) and volume (New Sales in Units) projections for the Mud Pumps market on the basis of the aforementioned segments at a global level. The next section of the report presents a summarised view of the global Mud Pumps market based on six prominent regions considered in the study. All the above sections evaluate the present Mud Pumps market scenario and growth prospects in the global Mud Pumps market while the forecast presented in the sections assesses the market size in terms of volume and value. In addition, it is imperative to note that, in an ever-fluctuating global economy, we not only conduct forecasts in terms of CAGR, but also analyse the market on the basis of key parameters, such as Year-on-Year (Y-o-Y) growth, to understand the predictability of the Mud Pumps market and identify the right opportunities available. Another key feature of this Mud Pumps report is the analysis of all key segments in the Mud Pumps market, sub-segments and the regional adoption and revenue forecast in terms of absolute dollar opportunity. This is traditionally overlooked while forecasting the market; however, the absolute dollar opportunity is critical in assessing the level of opportunity that a provider can look to achieve as well as to identify potential resources from a sales and delivery perspective in the Mud Pumps market. In order to understand the key market segments in terms of growth and installation of Mud Pumps across concerned regions, Persistence Market Research has developed the attractiveness index, which will help providers to identify real market opportunities. In the final section of the Mud Pumps report, a competitive landscape of the Mud Pumps market has been included to provide report audiences with a dashboard view, categorised on the basis of providers present in the value chain, their presence in the Mud Pumps market and key differentiating factors and strategies. The primary category of providers covered in the report includes Mud Pumps manufacturers. This section in the Mud Pumps market report is primarily designed to provide clients with an objective and detailed comparative assessment of the key providers specific to a market segment in the value chain of the Mud Pumps market. Examples of some of the key competitors covered in this report include National Oil Varco Inc., Schlumberger Limited, Gardner Denver Inc., Weatherford International Plc., China National Petroleum Corporation, Trevi-Finanziaria Industriale S.p.A., MhWirth, BenTech GmbH Drilling Oilfield systems, American Block Inc., Honghua Group Limited, White Star Pump Company L.L.C., Flowserve corporation, Ohara Corporation, Mud King Products, Inc., and Herrenknecht Vertical GmbH. The report covers comprehensive information about market trends, volume (Units) and value (US$ Mn) projections, competition and recent developments and market dynamics in the global mud pumps market for the study period of 2013 to 2026. The global mud pumps market is expected to reach a little over US$ 1,085 Mn over the forecast period, registering a CAGR of 4.4%. Growth in drilling activities in the oil & gas Industry to increase hydrocarbon production and ease of the mud circulation operation in drilling holes are some of the factors expected to lay a robust foundation for the growth of the global mud pumps market. Mud pumps can be classified on the basis of the number of pistons into duplex, triplex and quintuplex, which consist of two, three and five pistons respectively. The triplex segment is expected to dominate the mud pumps market in terms of value as well as volume during the entire forecast period. Triplex mud pumps find extensive usage in circulating drilling fluid with high pressure for deep oil well drilling application. These usage characteristics make them preferable for use, primarily in onshore and offshore oil well drilling applications. By the end of 2026, the triplex segment is projected to grow 1.42X its size in 2018 by value, creating an absolute dollar opportunity of nearly US$ 234 Mn during the forecast period. Mud pumps are widely utilized in the oil & gas industry. On the basis of the mode of operation, mud pumps can be classified as electric and fuel engine mud pumps. Fuel engine mud pumps use petroleum oils as the key liquefying agent. These types of mud pumps release hazardous gases into the environment. In order to contain the hazardous impact of fuel engine mud pumps on the environment, regulatory authorities are compelling manufacturers and consumers to opt for electric mud pumps, which do not emit volatile organic compounds and operate with low noise and low vibration. Electric mud pumps offer smooth operations in drilling rigs and are environment-friendly, which is why they dominate the market for mud pumps. The electric mud pumps segment is projected to grow with a 4.5% CAGR during the forecast period in view of the tightening emission control regulations and is expected to create an absolute $ opportunity worth US$ 134 Mn between 2018 and 2026. Among all the applications analyzed in this global mud pumps market study, the onshore application of mud pumps is expected to register about 1.43X growth in terms of value between 2018 and 2026. The offshore application of mud pumps is projected to register moderate growth during the entire forecast period, led by land oil field discoveries. In terms of incremental $ opportunity, onshore and offshore segments are expected to compete within large margins. The onshore application of mud pumps is expected to occupy over an 86% share in terms of value by the end of 2026. Increasing oil-well exploration activities, stable economic conditions and consistent growth in oil well drilling rig sales in the region are expected to drive the demand for mud pumps in the region. 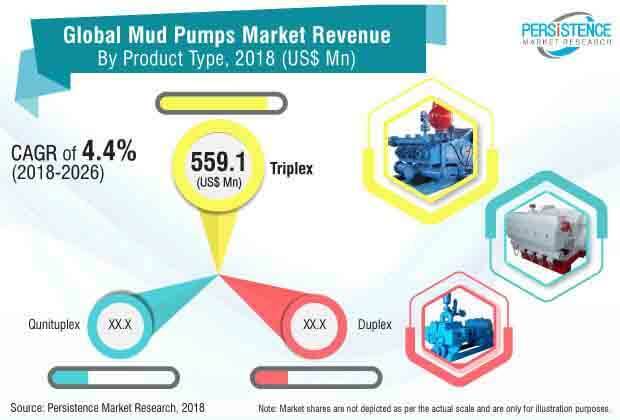 The comparatively well-established production sector in the region and increasing oil and gas industry and hydrocarbon consumption will create a healthy platform for the growth of the mud pumps market. Some regions including China and Europe are expected to gain traction in the latter half of the forecast period, owing to the anticipated growth of the oil & gas industry in these regions. North America is expected to register above-average 1.1X growth in the market. All the other regions are anticipated to exhibit moderate growth during the same period. Apart from Europe and China, all other regions are anticipated to lose market value share over the forecast period. China and Europe are collectively expected to register a CAGR of 4.3% by value. The global mud pumps market is consolidated with limited market players holding considerable double-digit market shares as of 2017. Globally, the top 12 players in the mud pumps market collectively hold between 53% and 58% of the market share. Over the past few years, the mud pumps market has witnessed significant technological advancement from the competition perspective. Acquisitions, collaborations and new product launches are some of the key strategies adopted by prominent players to expand and sustain in the global mud pumps market. Some of the key players involved in this market study on the global mud pumps market include National Oil Varco Inc., Schlumberger Limited, Gardner Denver Inc., Weatherford International Plc., China National Petroleum Corporation, Trevi-Finanziaria Industriale S.p.A., MhWirth, BenTech GmbH Drilling Oilfield systems, American Block Inc., Honghua Group Limited, White Star Pump Company LLC, Flowserve corporation, Ohara Corporation, Mud King Products, Inc. and Herrenknecht Vertical GmbH. How has the mud pumps market evolved over the past four years? What shape is the mud pumps market expected to take in terms of volume and value during the study period? What are some of the prevailing market dynamics in the mud pumps market? What are the competition developments and trends in the mud pumps market? What are some of the underlying macro-economic and industry factors impacting the growth of the mud pumps market? What are the important key challenges, opportunities and improvement factors for mud pumps market players? What are the important market positioning and key strategies of key mud pump manufacturers as per the market taxonomy? How is the competition structured at present and how has it evolved in the mud pumps market over the past few years? White Star Pump Company L.L.C.